Is Islam a repressive religion? Why do they hate us? Why don't they trust us despite all our assistance? Are they still in the dark middle ages? What is it like over there? Do they want to take us there too? Why do they blow themselves up and kill others too? What’s the way out of this? Will this war make my country more secure in the future? Is this the only solution to this problem? How do we eradicate threat of religious extremism from our backyard? These questions haunt our minds in the Western world and this novel has the answers to our questions illustrated through a powerful yet heart rendering story based on three protagonists representing the main forces involved in this matter of fact imbroglio. 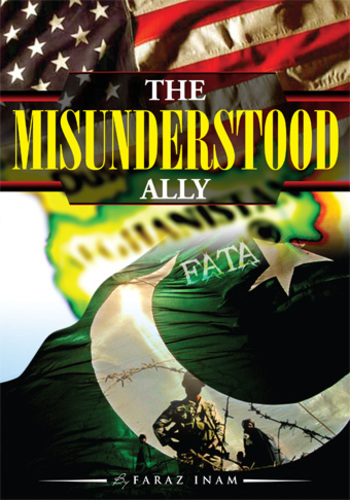 “The Misunderstood Ally” depicts a modern day story about the current instability in Pakistan, a Muslim Nuclear State, through the eyes of a gutsy and determined US Special Agent, Samantha Albright, as she lands in the enigmatic country. Story also reflects the travails of a brave and patriotic Pakistani Officer, Lt. Col. Dhilawar Jahangiri, as he grapples between his personal challenges and call of duty. The life of a ruthless but belligerent militant commander, Baaz Jan, gets projected too as he fights back for what he feels is right. This may be a novel but the environment it reflects is real. Its characters may not be original but the personas they represent are real. The events may not be precise but the motives behind their occurrence are real. Faraz Inam, the Author, is part of Pakistan’s moderate, progressive but silent majority. In his debut novel he has managed to movingly portray the different psyches prevailing in the region without being critical and has skillfully pulled the three threads together in such a way that the reader empathizes with each strand. As a recent press release stated, “From 2004 to 2011 American drones killed 2,200 civilians in Pakistan, including 168 children. Only 126 terrorist were killed in these attacks”. The readers through the course of this novel would understand the toll it takes on the hearts and minds of the normal people stuck in the cross fire as they endeavor to lead a normal life – a life free of violence and terror. This book is especially for those who want to understand the sensitivity of the other side and play their part in bringing harmony and peace in this world. The story may not have all the solutions but can make the reader understand all the perspectives and it certainly has the potential to make us rise from the ashes of despair and enmity to reach the zenith of compassion, friendship and tranquility. Available online at: Nielsen (UK), Bertram’s (USA), Amazon.com, Amazon.co.uk, Waterstones.co.uk, Blackwells.com, Gardners.com, Tesco.co.uk, Bowker (USA), Ingrams (USA), WHSmith.co.uk, and online direct from www.strandpublishing.co.uk. This press release was distributed by ResponseSource Press Release Wire on behalf of Strand Publishing UK in the following categories: Men's Interest, Entertainment & Arts, Media & Marketing, for more information visit https://pressreleasewire.responsesource.com/about.